Read Part I of this Article I here. While the Tyson/Holyfield match certainly marked the end of Iron Mike’s boxing career, his decline had begun years before. In 1990, Tyson found himself in the ring against a lesser known fighter named James “Buster” Douglas. It was clear from the start that Tyson was in for a challenge. Fearless in his approach of the reigning champ, Douglas conquered Tyson’s powerful inside strength with his long reach and relentless jabs. By the tenth round, Douglas was declared the winner by knockout, capping one of the greatest upsets in sports history to date. After their match, Tyson lamented that his heart simply was not in boxing as it had been before. Many have said that the writing was on the wall well before Tyson’s encounter with Holyfield, with some even saying that Tyson was done before his bout with Douglas. In any case, the boxing juggernaut’s fall from fame is a telling portrait of a perceived legend’s infamous collapse. A tale that shares a similar trajectory to our newest Sound And The Fury match and its battle for the hearts and futures of a generation of students. For the past 90+ years, students in the United States have been sitting in classrooms, auditoriums, and gymnasiums for some version of a standardized test. Either the SAT or ACT have been the standard for American entrance examinations over this time, and students futures have rested squarely on their ability to perform on either of these exams. Over this time, college admissions folks have weighed a student’s ability to answer randomized questions about eccentric verbal analogies, a range of mathematical calculations, and other specific content quite heavily on the student’s likelihood to gain a coveted spot in their Freshman class. Out of this has grown a multi-million dollar testing industry, a comparatively lucrative test preparation industry, and a rite of passage for countless young people. In the past 30 or so years, many very selective colleges have continued to emphasize high test scores as an imperative part of an applicant’s profile. Coupled with frequent use of pre-tests (such as the PSAT and Aspire or pre-ACT) and state-wide standardized tests, the SAT and ACT have boomed. Additionally, as America has pushed its college-for-all agenda, these tests have become an integral part of college admissions offices ability to differentiate students as they sift through the increased numbers of applicants. More recently, however, the tests themselves, and the industry as a whole, has come under more direct fire. Fueled by over-anxious parents and students, as well as college admissions offices finding an ever loosening correlation between success and test scores, an increasing number of stakeholders have begun to ask pointed questions: Is there still value in the standardized testing process? Do these tests actually mean anything? Why are students investing their time and resources in this way only to reap very little benefit? While there has indeed been increased media attention to the value of these tests, the line of questioning posed by stakeholders is hardly new. 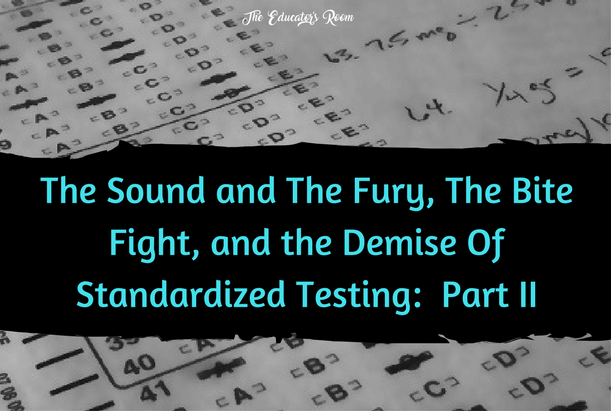 Just as there were those that projected the downfall of Iron Mike well before his Bite Fight encounter with Holyfield, there have been those that have predicted the demise of standardized testing. 32 years ago in the lovely town of Lewiston, Maine, the faculty of Bates College sat around a boardroom table and decided that the use of standardized testing in admissions was not what the rest of America was claiming. A pioneer in their efforts, the folks at Bates believed that a student’s profile was much more complex than what could be represented in a test score, and, in fact, a test score might actually misrepresent a student’s likelihood to be successful in college. Bates argued that requiring test scores dramatically reduced the variety of applicants a college might see in its typical pool, thus limiting the school’s ability to attract the most outstanding candidates for an entering class. Much like those claiming that Tyson was done well before even the Douglas fight, Bates has been one of the lead voices in touting the decreased value of the seemingly unstoppable force that has been standardized testing. In fact, at the time of this article’s completion, 925+ colleges and universities have followed Bates’ lead by either de-emphasizing or not requiring testing as part of their admissions profiles — with more announcing nearly every week. Nearly all of these schools have cited similar evidence to Bates: They have found little to no correlation between a student’s test scores and their likelihood to do well at their school. Three new tests have been introduced, including a new pre-ACT (the Aspire), a new PSAT, and an entirely new SAT. Dramatic increases in security by both companies (ACT and SAT), particularly abroad. New scoring guidelines for the SAT including a concordance table that has students, counselors, and admissions folks looking across three different scoring types to tabulate what their scores might mean. New writing section requirements that have many counselors and test prep folks scratching their heads as they provide students with expertise on preparation. Additionally, a reduction in the number of schools that consider the writing section in a student’s profile has also occurred. New and revamped test “official” preparation services. Kaplan for ACT, and Khan Academy for SAT. Increasingly complex reporting that allows students to dig deeply into their scores in hope of figuring out how to target their preparation for future tests. These changes indeed appear to all be positive, but in reality, they leave glaring questions to be answered in the coming years. Similar to those who question whether a change in coach or technique would have altered the decision of Tyson’s bouts with Douglas and Holyfield, the heart of these testing questions is about inevitability. Is a significant testing industry downturn already happening, and is there anything either company can do about it? My hope is that the increased attention raised by stressed out students and parents, guidance staff advocates, and college admissions staff members places standardized testing more squarely in the center of our national conversation about values: The values these tests are reflecting, and the value they have for the future of our young people. Furthermore, my hope is that test optional leaders such as Bates will continue to push us to reconsider our approach to testing well before students become earless Holyfields staring down at the infamous Tyson.